Build Strategic attacks by combining styles and bases to adjust to the situation. Your character's styles fuse with basic attacks to create a huge variety of moves! Each fighter possesses a Unique Ability which gives them access to all-new strategic options. Bend time, use teleportation, summon minions, change forms, and more! Team up against bosses, call in assists, battle in tag teams, and fight in specialized arenas! The possibilities are endless! Over 70 Fighters to Master! Each BattleCON Fighter brings a new unique mechanic to the table–gain levels mid-battle, transform to access new attacks, infuse your weapons with elemental power, and more! Get Ready for the Fight of your Life! This set features 18 Fighters from the World of Indines Universe! Check out the full description to learn more. This playmat is compatible with all BattleCON games, and features the characters Trias and Voco from the World of Indines. BattleCON Half-Mats are designed to be used in conjunction with other BattleCON Half-Mats to make a BattleCON board with ample space for both players. 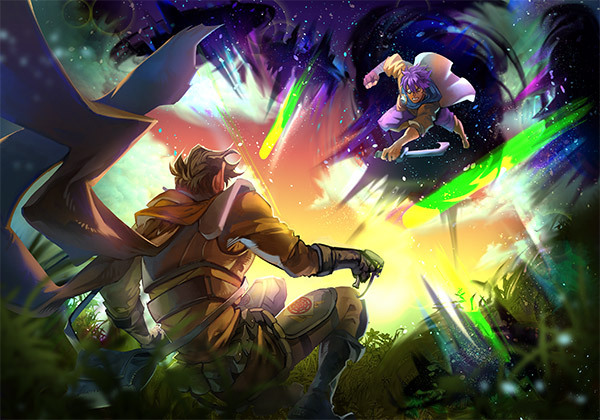 This playmat is compatible with all BattleCON games, and features the characters Eustace and Heketch from the World of Indines. BattleCON Half-Mats are designed to be used in conjunction with other BattleCON Half-Mats to make a BattleCON board with ample space for both players. Will you save the world, or rule it? 2 Players, 3-5 Players in additional game modes. This set features 30 Fighters from the World of Indines Universe! Check out the full description to learn more. This is an Expansion. BattleCON: War is required to play. This is an Expansion. BattleCON: Devastation is required to play. This is the second edition of Devastation Extended. It does not contain the BattleCON: War of Indines Upgrade Pack, as these changes were put into War Remastered. This is an Expansion. A BattleCON Base Game is required to play. Strikers brings crossover fighting chaos to BattleCON! This box contains one complete Fighter for BattleCON. A strong fighter with excellent stats, Marjoram uses her tactical knowledge to press the attack or ready her defenses each turn, and gains bonuses based on whether the opponent’s power exceeds her own attack power. Guest Fighter from the world of Temporal Odyssey! Jin utilizes his army of Scout drones to make coordinated attacks against the opponent. He also possesses various defensive measures to lock down opponent’s effects and avoid direct conflict. While his scouts aren’t the most capable of minions, they get the job done. Raritti has a deck of fortune cards, which she uses in conjunction with her attacks to adjust the outcome of the duel. You may recognize a few of your favorite cards from the world of Millennium Blades in her deck!